Although I think spring is the best time to agate hunt given that the recently melted icebergs dump their load of new rocks on the beach, there have been a lot of good finds this fall. I do agree that the fall storm waves mix the rocks and sometimes push new rocks up onto the beach. Other times, though, the waves will undertow the rocks out back into the lake and/or cover them up with sand. None the less, there are several recent finds featured this month. 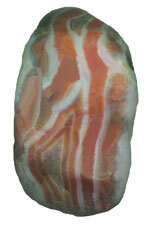 My friend, Renee Beaver who appeared last month, is featured again with a 1/3 pound candy stripper. 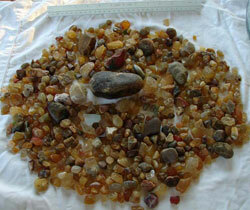 The Weihing family contacted me early this fall about their successful agate hunting trip to Minnesota. Ashley, Kayla, and Courtney show off their finds in the pictures below. Ron and America Dukowitz emailed me the picture below documenting their recent U.P. agate finds. 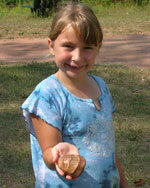 And finally, I recently took a few days off to agate hunt in Minnesota with my friend, Tom Tomasek. 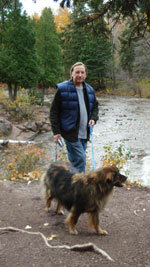 Pictured below is Tom and his dog Alex, as well as the agates he found on the trip.